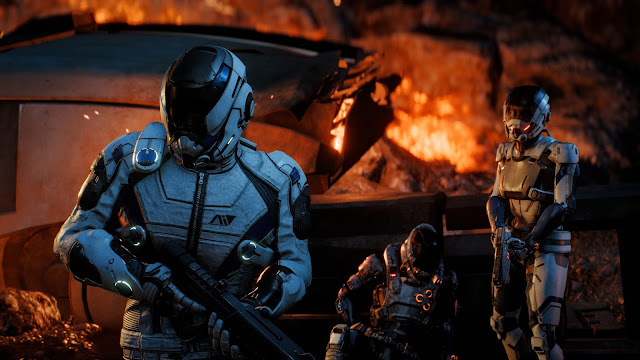 EA and BioWare know that they’re on to a big thing with Mass Effect: Andromeda. Of course they do. In development now for over five years, this game has a lot to live up to, as the original trilogy is rightfully remembered as a classic trilogy. 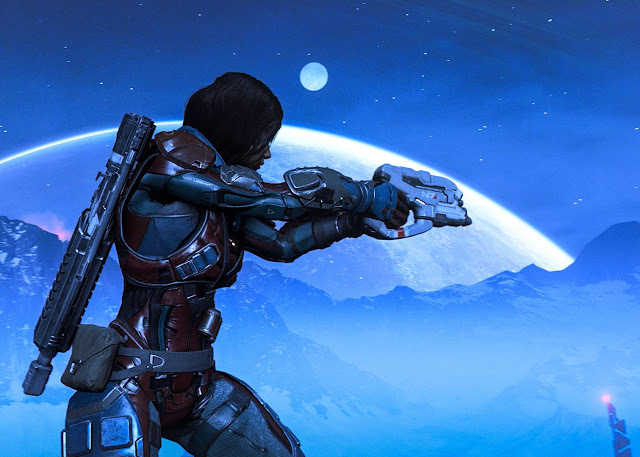 Having had the opportunity to get hands-on time with some of the early parts of the game, there are some things that are abundantly clear; this is indeed a Mass Effect game. I don’t mean for that to sound flippant, and nor is it a bad thing by any means. In a presentation the Producer of the game, Fabrice Condominas, said that the team has worked hard to up the quality of the action for this Mass Effect, to include bigger, faster, and more exciting set pieces. It’s explicit that BioWare sees the series as a shooter franchise, and those RPG elements that are running in the background can be ignored if the player hasn’t got the patience for it. From the hands-on, it’s easy to see what he’s talking about. There are skills development menus, crafting, and other RPG elements to play around with if you’re really inclined to. Otherwise you can ignore them completely, simply set the auto levelling on, and get on with the excitement of the adventure, and certainly once the guns are out you’re not going to have much time to think about the statistics crunching in the background. And yet Mass Effect is also in both heritage and reputation an RPG, which is most evident in its narrative storytelling. The previous trilogy’s great strength was in its complex story building, through which a whole host of moral and philosophical themes were explored. 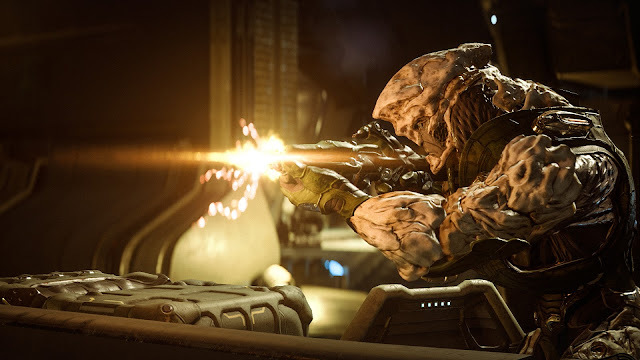 It’s a true mark of quality storytelling when the writers have managed to be ambiguous enough about an enemy such as The Reapers - an existential threat that deliberately genocides all intelligent life in the galaxy every so often, and manages to be quite justified in doing so, if you consider it from particular philosophical angles. Set as it is one galaxy over, in Andromeda, this new game is a very different narrative beast, and this time around, humans are the aliens. This point is driven home in the opening moments of the game, when the player’s space ship has finally finished its 600-year journey from Earth to reach Andromeda, and is approaching a planet that the crew hopes is suitable for civilisation. The spaceship approaches the planet, looking every bit like the scenes in science fiction films picturing hostile aliens approaching Earth. We are now the existential threat, potentially, in the eyes of the locals. Will humans look to integrate with other life forms in this new galaxy? Or will they colonise and exploit, as history shows humanity has a track record for doing? These are questions that we’ll be asked in this game, and I simply wasn’t able to get a sense of that from my hands-on time; EA and BioWare were much more interested in getting us to experience the action and narrative setup at the hands-on event. But there are hints of how much more complex the moral decision-making in the game has become. In the previous Mass Effect series you were generally given binary decision-making options; would you behave like a ‘paragon’ or ‘renegade’? After making a couple of such decisions you would be largely locked into that behaviour for the rest of the game, since important conversation and narrative arcs would be blocked off if you straddled the middle (and there was no benefit in being centrist whatsoever). This time around there’s a much more complex approach to decisioning. This time around you’ll have four different “motivations” to choose between – such as logical, emotional, or intellectual, and it’s the combination of decisions you take that will affect how others respond to your character. Simply taking one single path is no longer advantageous, and you’re really encouraged to role-play a character who might be rational for some decisions, but then allows emotion to take over at other times. This system was what had me most excited from my hands-on. What I loved most about the Mass Effect trilogy was those interactions, both with my soldiers-in-arms and the general people around me. But I, too, chafed at being largely restricted to one behaviour type each time. 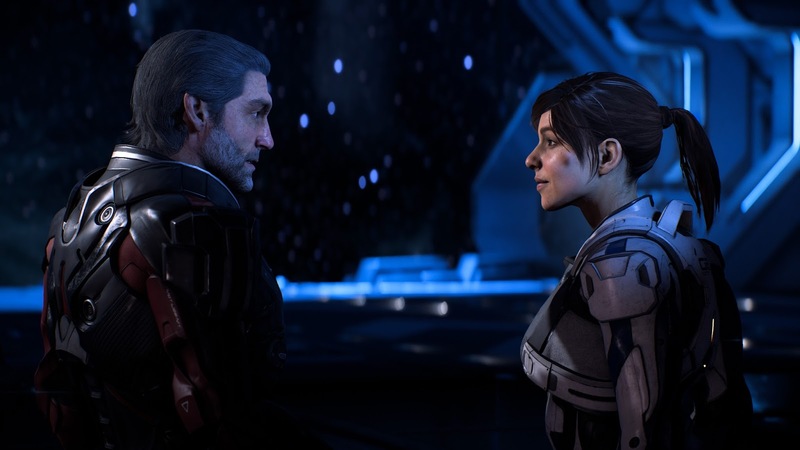 If BioWare’s promise for nuance is executed as well as it can be (and there’s no reason to doubt it), then I certainly see this as the most mature storytelling experience from the series to date. Unfortunately, while I wasn’t able to get a proper sense of scale, Condominas from BioWare was keen to really drive home the point that this game is a massive step up in scale to its predecessors, and he was constantly referring to how long you could spend in various areas, simply interacting with other characters. I also wasn’t able to get a sense of the direction that the broader plot will take, but Condominas also promised that the villain will be as open to interpretation as the Reapers. You’ll be able to listen to the entire interview next week in our podcast, so stay tuned for that. The only real issue I have with the game won’t be fixed, and likely won’t be an issue for most; I simply don’t like EA’s Frostbyte engine. Originally developed for Battlefield games and allowing all kinds of incredible things to happen with destructible environments and the physics of gunfights, I find it to be absolutely terrible at rendering characters. Faces are detailed and precise, but also bizarrely wooden, and there’s something deeply unsettling about the way the eyes move within their heads. For a FPS title like Battlezone, or even a sports game like FIFA, this is less of an issue because close-ups and interactions are relatively limited; but Mass Effect is a game where you spend a lot of time staring at faces talking to other faces, and I think it’s unfortunate that BioWare is lumbered with an engine that doesn’t really work to the game’s needs. There are games out there with better-looking character models - Horizon: Zero Dawn, for instance - and EA in general, if they plan to continue using the Frostbyte engine, needs to work on those character renders. That said, the game’s world (or, more accurately, worlds) is masterful, and by the end of the demo I was itching to learn more about it all. BioWare is a company that, ultimately, crafts stories, and a couple of hours of playtime is never enough to form a firm idea of what to expect in a game of this scope. What I am convinced of, however, is that - as this is a Mass Effect game so similar to its predecessors - I am almost certainly going to be utterly enthralled by it once I get to play the complete game.